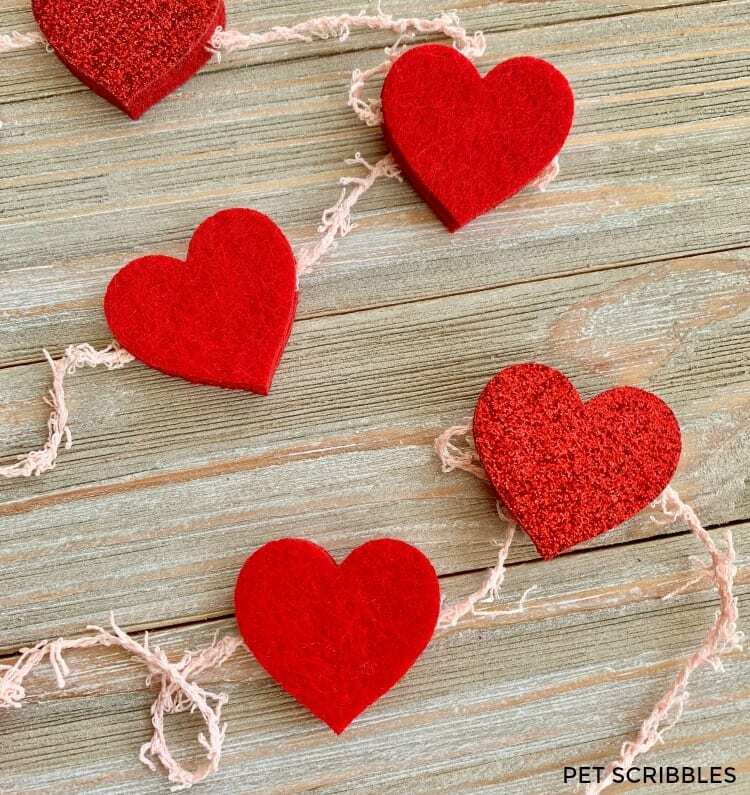 This easy no-sew felt heart garland can be put together with packaged red felt hearts, adhesive glue dots and vintage-looking scrubby cotton yarn from the craft store! 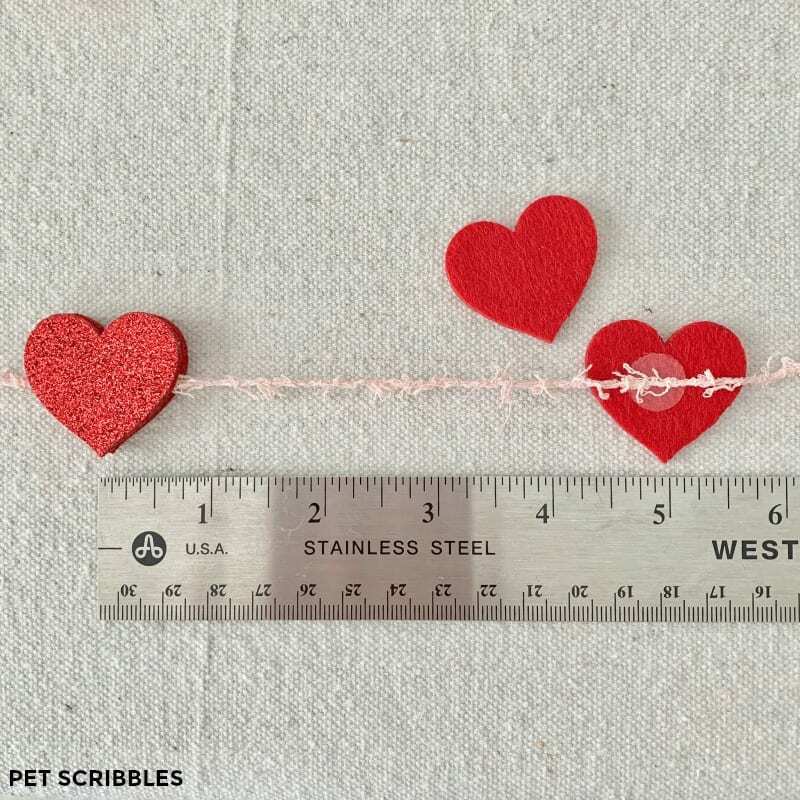 I’ve seen so many pretty felt heart garland tutorials this year on Pinterest, but I feel like each one requires at least some sewing. 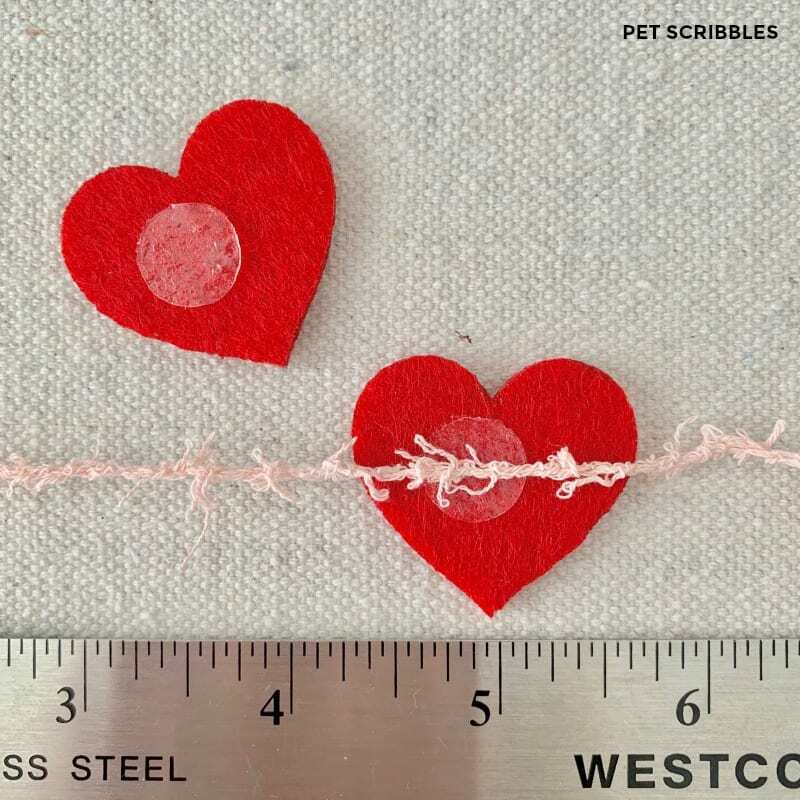 I wanted to created something much easier, so I came up with this easy no-sew felt heart garland instead! 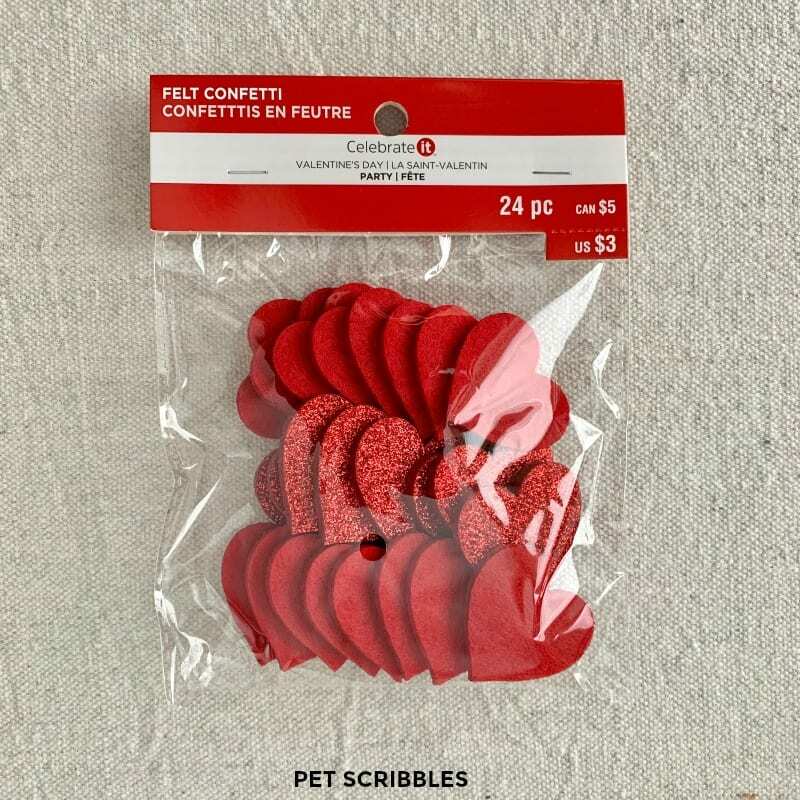 It all begins with these red felt hearts, nicely pre-packaged, from Michaels. 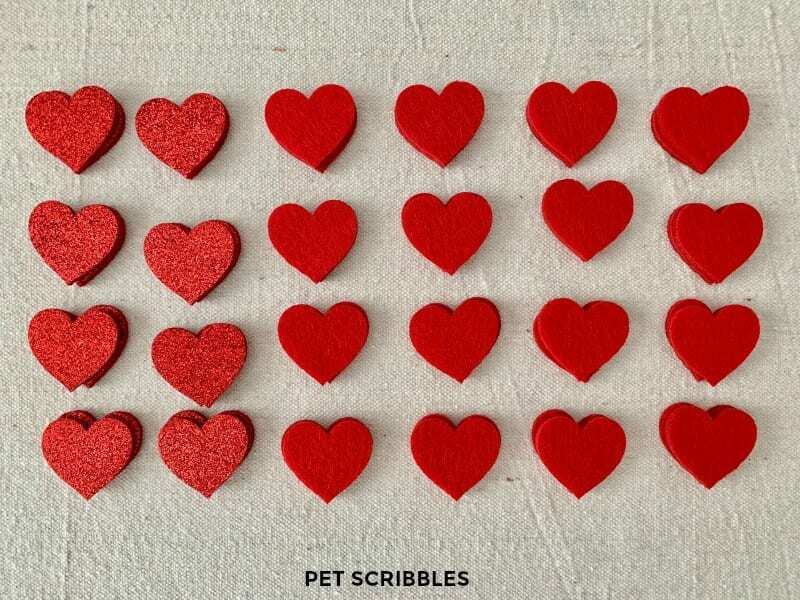 You get 24 felt hearts: 8 red glitter hearts and 16 red felt hearts. 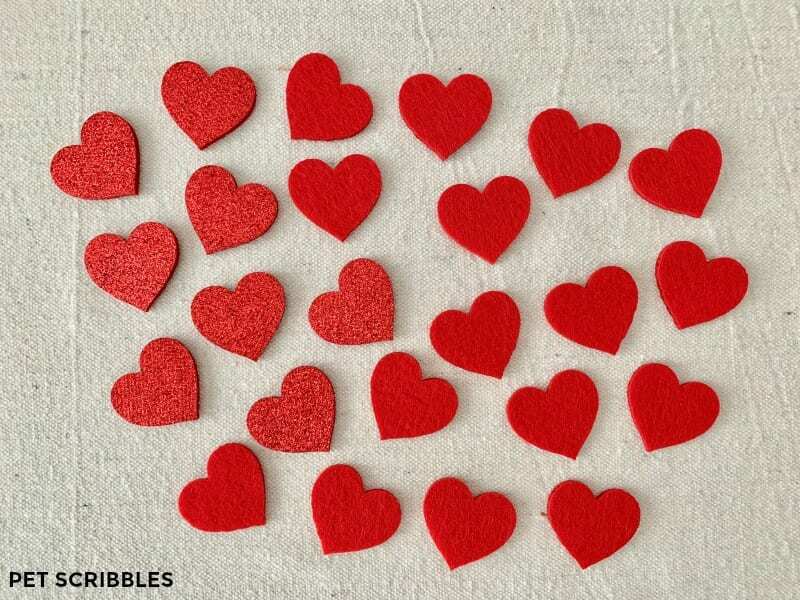 The glitter hearts are also felt, and even better for me: these glitter hearts didn’t shed one tiny speck of glitter! You’ll love how easy this is to put together! (I don’t see these anywhere on Michaels’ website unfortunately, but I found similar ones, without glitter, here on Amazon.) 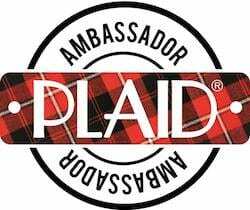 Also check other craft stores and dollar stores too. 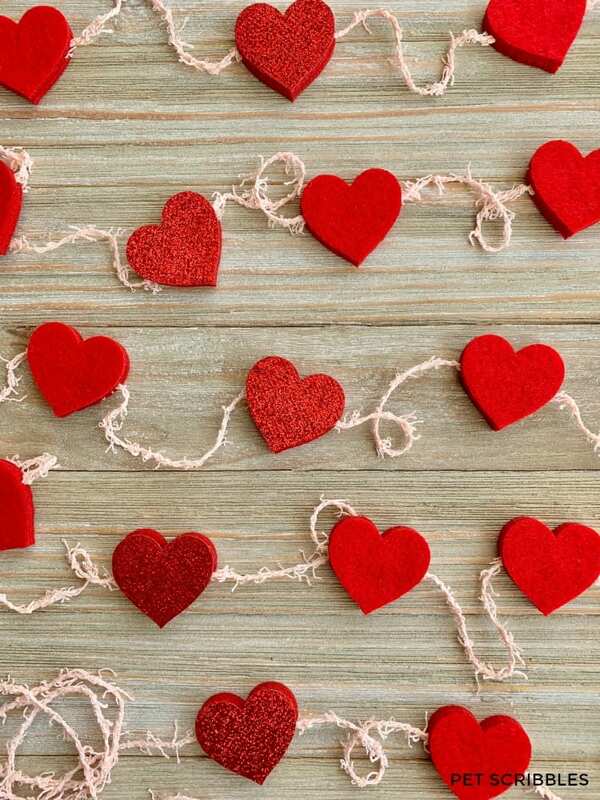 First, open your packages of red felt hearts and sort them out to see what you have. I doubled up my hearts — which is why I purchased two packages. I want my garland to be pretty from the front and back, so these hearts are going to be glued back-to-back. 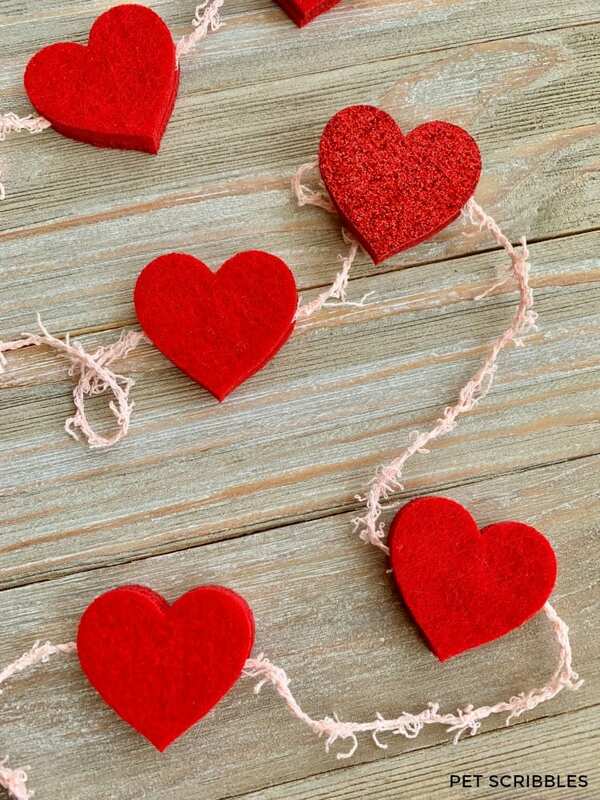 Next, determine the arrangement for the garland, if the hearts are different colors, patterns or textures. 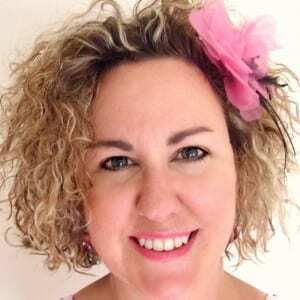 I am doing two felt hearts, followed by one glitter heart, followed by two felt hearts, then one glitter heart, and so on. 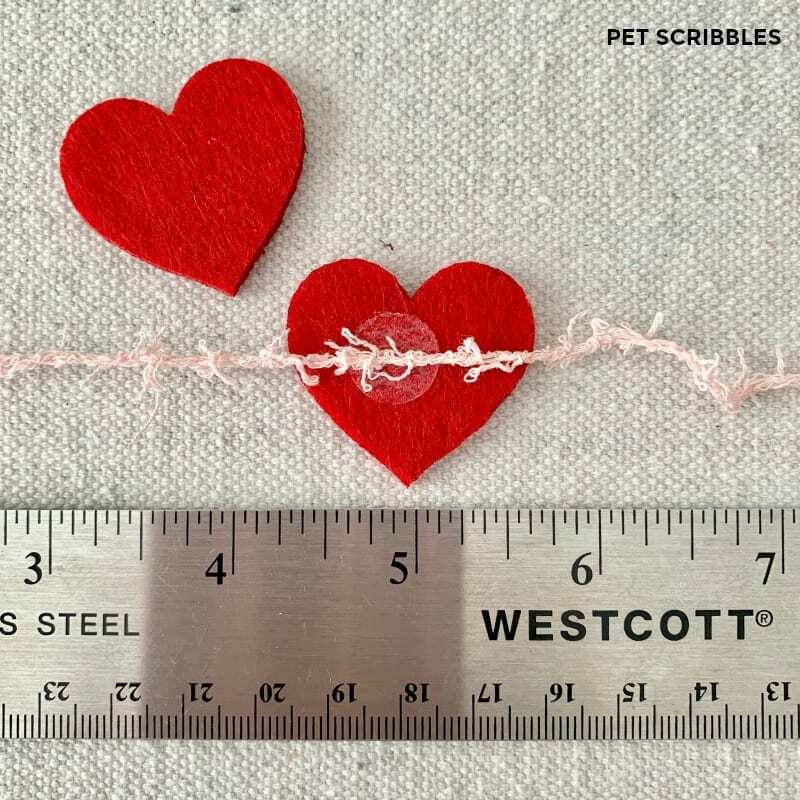 Using a ruler, measure out how far apart you want your hearts to be from each other. 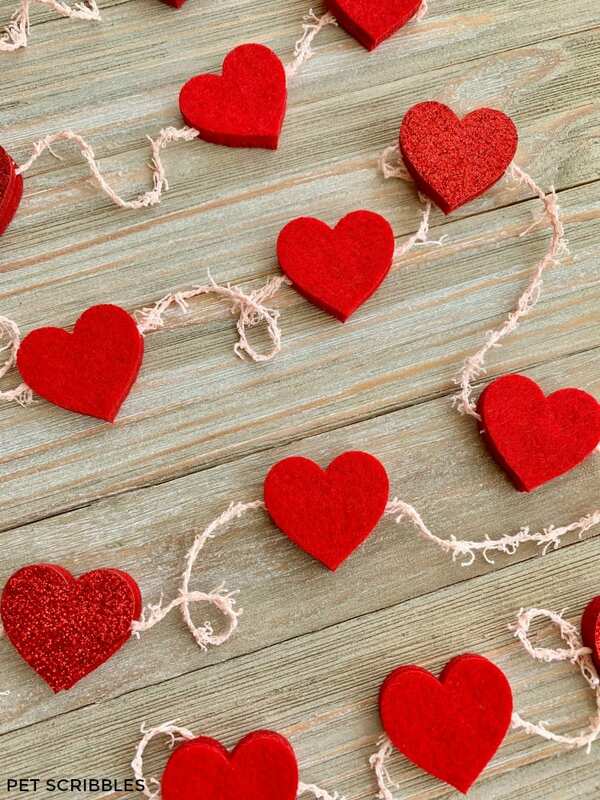 I’m spacing each heart five inches apart on the garland. Unravel a good amount of yarn — way more than you’ll need — for your garland. 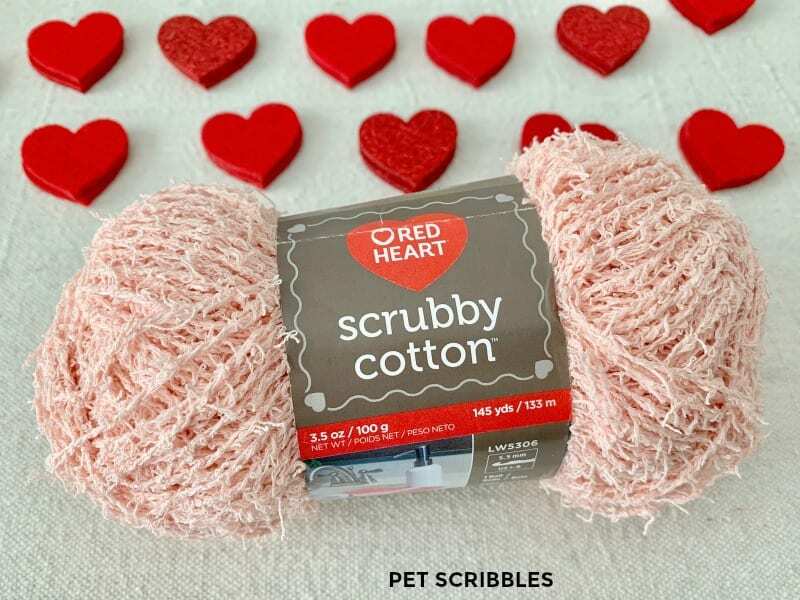 I love this cotton scrubby yarn I found at Michaels. 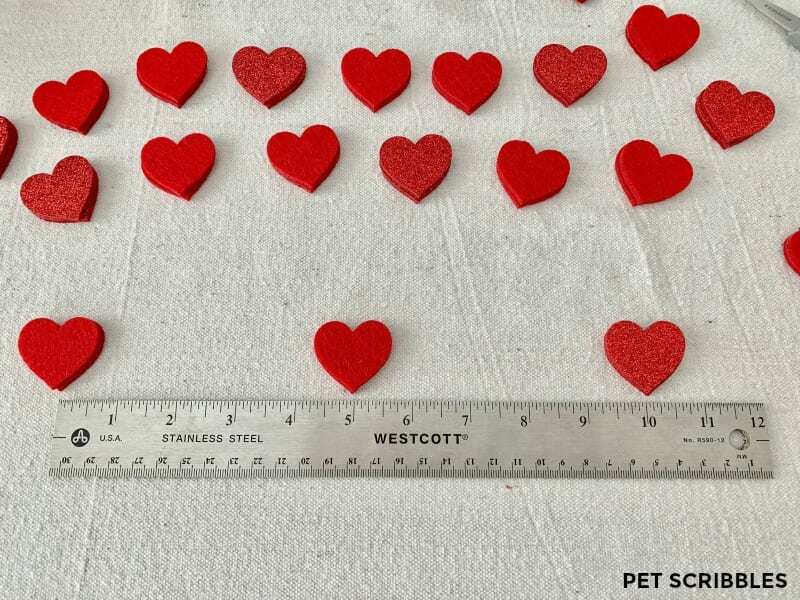 It looks almost vintage for my easy no-sew felt heart garland! 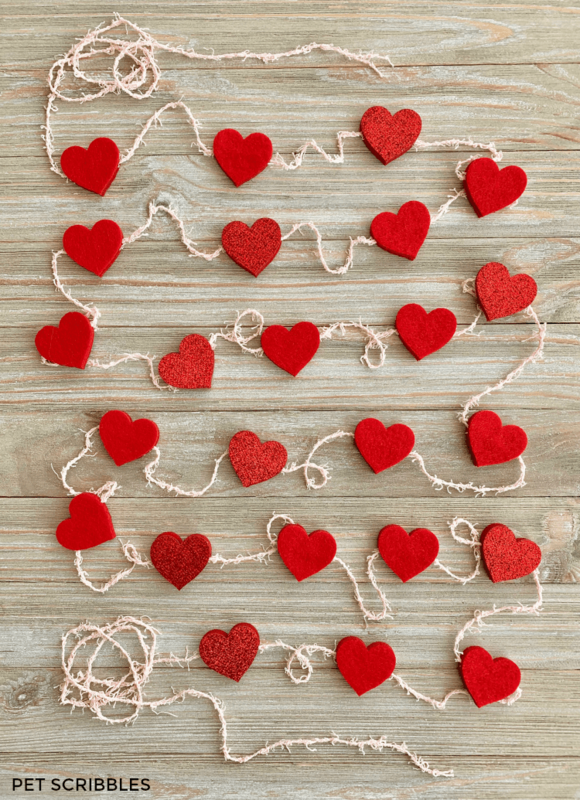 Attach the felt hearts to each other with Glue Dots, with the yarn sandwiched in between them. 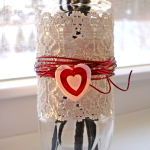 Add a Glue Dot to the inside of a heart, then place the yarn over it and gently press down. Then, add a Glue Dot to the other heart (on the inside as well) and sandwich the two hearts together over the yarn. Continue in this manner, using the ruler as your guide, until your garland is complete. This can be made rather quickly, and the end result is very sweet! The mix of textures and color makes me smile! Here the bright red felt and shiny red glitter are contrasted with the pale pink shabby yarn. 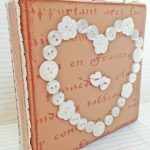 Here’s another fun project for you! 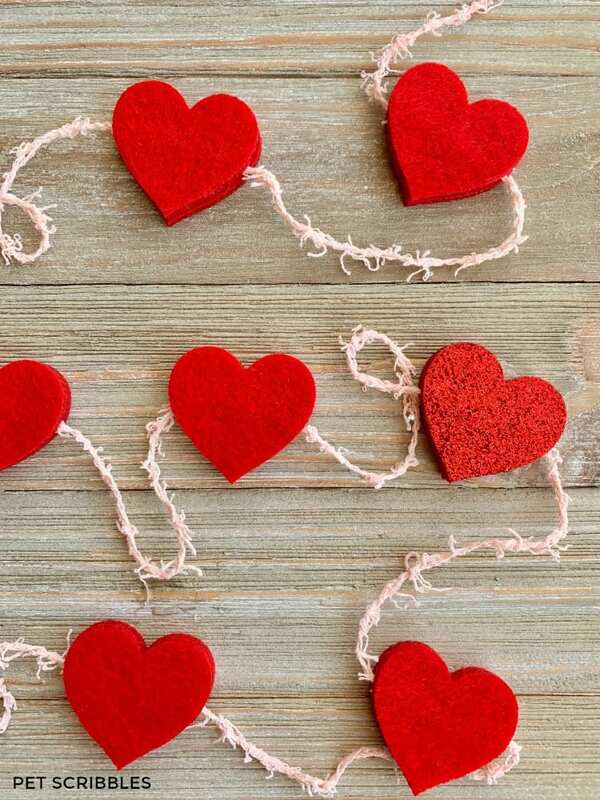 The hearts and the square are unfinished wood pieces. 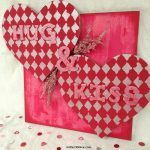 Paint and stencil them, then glue it all together! Add chipboard letters of your choosing, and cover them with glitter paint! 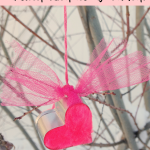 Check out more Valentine’s Day projects below, under the “More from my site” section! 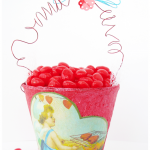 You can also check out my Valentine’s Day section of my website!